Using Surfer's Logarithmic contour level method, how are the minor contours created? They appear to be linear. When the Level method is set to Logarithmic, the major contour lines occur at the decades (0.1, 1, 10, 100, 1000, etc.). The distance from 1 to 10 is the same as the distance from 10 to 100. This is a proper logarithmic scaling with log values of equal spacing. You then have the option to specify the number of minor contour levels per decade (the default is 8). So between the major contour lines at 1 and 10, consider the 8 minor levels at 2, 3, 4 , 5, 6, 7, 8, and 9. These are not the same distance apart. The distance from 9 to 10 is much smaller than the distance from 1 to 2. The actual numbers (2, 3, 4, 5, 6, 7, 8, 9) are linear, but what makes them logarithmic is the unequal spacing between them. 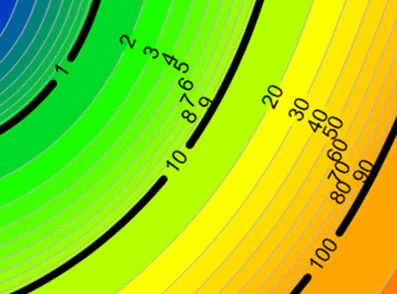 The major contour lines at the decades are logarithmic values that are equally spaced, and the minor contour lines are linear values that are logarithmically spaced. If you would like an option to display the minor contours with a logarithmic distribution, please email surfersupport@goldensoftware.com.